Porridge though sounds the same is not entirely the same when it comes to the different dialect groups of the Chinese. 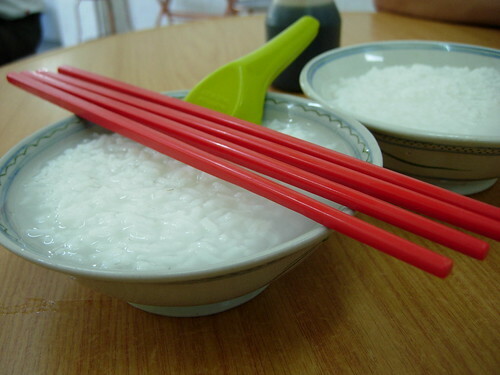 Although porridge here is cooked using rice, the style of cooking is entirely different. Cantonese porridge is cooked till mushy and you cannot see the grains of rice. Usually, they added dried seafoods like scallops, oysters and other foods stuffs to flavour the porridge which is call ‘chok’. Flavourings like salt, sesame oil and pepper are added in the process of cooking. Meanwhile, I will feature the Teochew porridge today. Well, in the olden days, when people live in poverty and rice is hard to come by, they cook porridge as one cup of rice can make into several bowls of porridge. It is pure plain rice and water. Sometimes sweet potatoes are added into this porridge as during the Japanese occupation in Malaya during the WWII, most of the villagers survived on sweet potatoes and also tapioca. 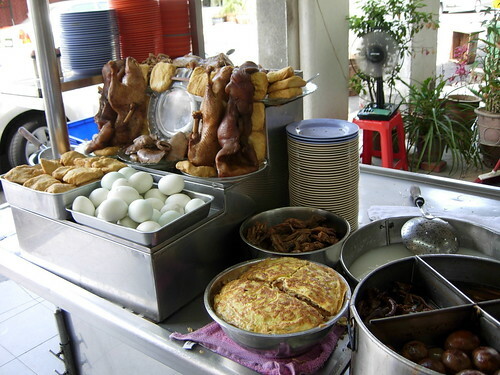 Teochew porridge is usually served with a lot of preserved foodstuffs like salted duck eggs, salted vegetables, salted fish and fermented beancurds. Sadly, a lot of those Chinese men who had these staples during their younger days, are now afflicted with nose and throat cancer. I know at least three of these gentlemen. It is believed that those preserved food stuffs probably contain harmful substances that cause nose cancer. Poverty also caused the Chinese to resort to eating every parts of the pig. The above is the pig’s ears. 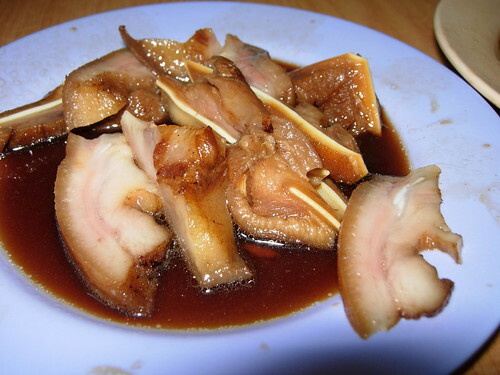 It is actually rather nice because the soft bone (or whatever they call it) is quite crunchy and the gelatinous part is not as oily as the fatty pork. This porridge stall sells every parts of the pig. Well, almost. The intestines, pig’s tails, pig’s ears, duck’s intestines, duck’s web feet and etc etc. Tai Buan is a nice place to eat Teochew porridge as the stall is very clean and I like the mild tastes of their dishes. Tai Buan is located at Jalan Muntri. Jalan Muntri is the road directly facing Penang Cititel on Penang Road. Just go straight. It is a few blocks away from the Hainan Temple. Open for lunch till dinner. Wow .. those spare parts are hanging all over the place, looks kinda scary to .. err .. consume. Anyway, I am not really a spare parts person as per say. Good coverage on porridge. I am a hokkien lang myself … hence my “moi” is usually very plain .. with chai poh and salted fish.